"The Bogan Delusion" was interesting. Written in blog-style, chatty yet informed, it questioned what is meant by the term "bogan". This is a term difficult to define, which is the author's point. If you've not heard of "bogans", think "white trash" or similarly dismissive and derogatory terms. But do so with the knowledge that many Australians proudly self-identify as "bogan". I enjoyed the book's many references to Australian popular culture. I nodded and smiled and yes, I knew the words to some of the songs :) But underneath this surface chat was a deeper question. The book is really about the spaces we occupy. How we claim, defend and shift our cultural, emotional, economic and ecological landscapes. Hence the violence with which people label and attack notions of "boganness". 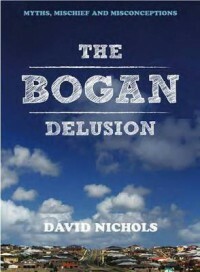 "The Bogan Delusion" triggered a degree of reflection. How do I define a bogan? I've typed and retyped my answer, but after reading this book, I'm well aware that all my definition would reveal is my own experience and prejudice. Oh well. Here goes. I grew up among bogans. The old neighbourhood is long gone, lost to rezoning into an industrial development. But our neighbourhood was bogan in its loyalty to its own, its tolerance to those within it but not of outsiders, and in the passion with which everyone pursued their own interests. Bogans are closer to anarchy than other sections of society simply because they don't expect society to change, or attempt to make society change, to support their dreams and needs. Bogans live in often harsh realities, but they're resilient, self-aware, and have begun to award themselves the respect others try to take from them. "Bogan and proud" is the slogan. But to go back to "The Bogan Delusion" it had an interesting critique of housing development. I'll be looking at the suburban block differently from here on in. Perhaps it's not as bad as the inner city apartment building developers would have us believe?